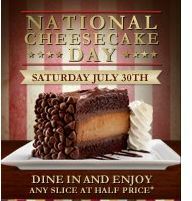 Saturday July 30th, 2011 is National Cheesecake Day. Head over to the The Cheesecake Factory and get one slice of cheesecake when you dine in. YUMMY! !